Region 1: Water in the stratosphere. Region 2: The sky, where the birds fly. There was therefore, at the original Creation, a water canopy in the stratosphere, above the sky (the firmament). After Noah's Flood this water canopy in the stratosphere was removed, and the water became part of the waters of the Flood of Noah, approximately 4,400 years ago. The water canopy in the stratosphere is therefore no longer present. The water canopy originally provided protection against cosmic radiation from outer space. The temperature was probably much warmer, with no variation of temperature over the entire planet because of the "greenhouse effect" of the vapour canopy in the stratosphere. This perhaps explains why Mammoths preserved in the permafrost in Siberia have tropical vegetation in their stomachs. One of the very important functions of the upper atmosphere today is that much of the dangerous radiation from the sun is filtered out. 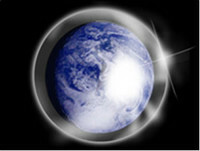 However, some dangerous radiation still gets through to the surface of the Earth. This is why, for example, overexposure to sunlight can cause skin cancer. The blocking of dangerous X-rays and gamma rays would probably have been much greater before the Flood. This probably accounts for the much longer life spans of the patriarchs recorded in the Bible (over 900 years). Genesis 2:5-6 indicates that at least prior to the creation of Adam, rain did not fall but that the plants were nourished by springs coming up out of the ground. The Bible does not actually mention rain until the Flood, and a canopy by providing a greenhouse effect could have lessened the need for the water cycle. If Noah was the first person to see a rainbow, that would add further strength to the canopy theory. Gen. 7:11-12 tells us it rained for forty days and nights. Such a lengthy deluge would be impossible today because there isn't nearly enough moisture in the present atmosphere; therefore, there had to be much more water in the heavens of Noah's time. Many ancient cultures have legends that seem to describe a canopy-type phenomenon. For example, the Babylonian creation account, Enuma Elish, mentions fog, clouds, or mist covering the early Earth. Such fossils as palm trees in Alaska, crocodiles in New Jersey, and petrified wood in the desert suggests a warmer climate in the past and perhaps a more uniform worldwide climate which a canopy might have provided. 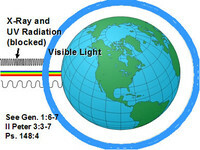 Although Genesis mentions seasons in relation to the creation of the heavenly bodies, summer and winter seasonal heat and cold as such are not mentioned in Scripture until after the Flood. reptiles such as the pteranodon to have taken flight. It is doubtful that these creatures would be able to fly in today's thinner atmosphere (see just below). 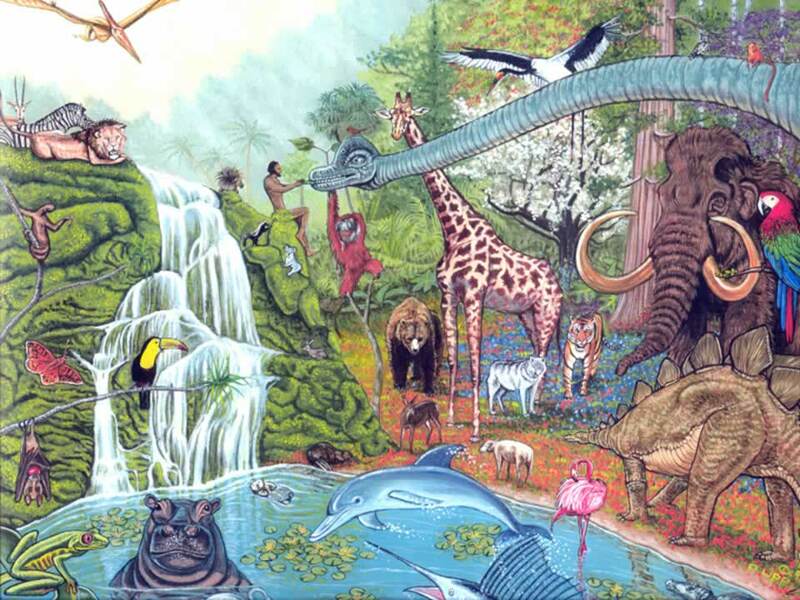 A canopy might be the answer to the long ages of the early humans as well as the giantism found in some plants and animals in the fossil record (see below). The canopy would have absorbed much of the harmful radiation that is known to have damaging effects on organisms. With less radiation reaching the surface of the Earth, living things could have lived much longer and in the case of some species, grown to giant sizes. Also, increased air pressure and oxygen would have been beneficial. The water canopy in the stratosphere would have dramatically increased the partial pressure of gases on Planet Earth, causing 50% higher concentrations of Oxygen and Carbon Dioxide. This is proved in experiments on Pre-Flood air trapped in fossilised tree sap, now known as the semi-precious stone, Amber. According to Time Magazine the oxygen content in Amber is 50% higher than it is now, (see Time Magazine, Nov 9, 1987, p. 82). Amber is a semi-precious stone, commonly used in ladies' jewellery. 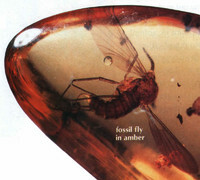 Amber is actually fossilized tree sap, and frequently contains either insects, or bubbles of air. 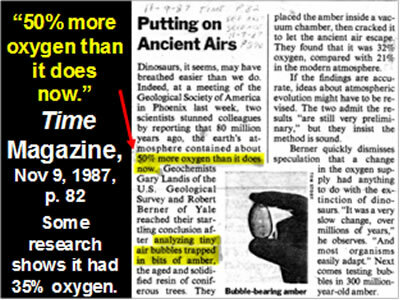 According to Time Magazine November 9, 1987, p. 82, bubbles of air in Amber have an oxygen content that is 50% higher than the present atmospheric air. According to this article in Time Magazine, Geochemists Gary Landis of the US Geological Survey and Robert Berner of Yale analyzed tiny air bubbles trapped in specimens of Amber. They placed the Amber specimens inside a vacuum chamber, and then opened the Amber, allowing the ancient trapped gases to escape. They found that the air contained 32% oxygen, which is much higher than our current 21% oxygen content in the atmosphere. This finding is confirmed in The New Scientist Magazine published on March 11, 2000. According to this article the air trapped in Amber has 35% oxygen. These findings confirm that Planet Earth had much higher Oxygen and Carbon Dioxide levels at an earlier date, and would seem to confirm the theory about higher Oxygen and Carbon Dioxide levels in the atmosphere, caused by the water canopy before Noah's Flood. 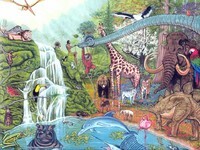 The Garden of Eden conditions described in the early chapters of Genesis were probably reflected all over the planet. There was probably abundant vegetation, animals, birds and fish. Because of the warmer and more constant ambient temperature, and the high partial pressures of Oxygen and Carbon Dioxide humans, animals, birds, insects, and fish were much larger, as revealed in the fossil record described below. There is a general teaching that early man was primitive. This is certainly incorrect. Adam and Eve were created in the image of God, and actually would have been superior to us in every way. Think about it: These two individuals held all of the genes that have been passed down through all generations until you and I. Because of the protective effect of the water canopy, there was protection from damaging ultraviolet rays and gamma rays, with probably much lower incidence of consequent diseases such as cancer and foetal malformations. Because of the higher oxygen levels, the high blood oxygen levels would have contributed to extreme longevity, resistance to bacterial and viral diseases, and greater metabolic efficiency, with consequent greatly enhanced athletic ability. The average recorded life span in the Bible of the early patriarchs is 912 years. This is in stark contrast to today's much shorter life spans, with 70 -80 years being typical. This may be accounted for by the higher oxygen content, the protective effect of the water canopy, lack of disease, better diet, and much less hostile weather patterns. 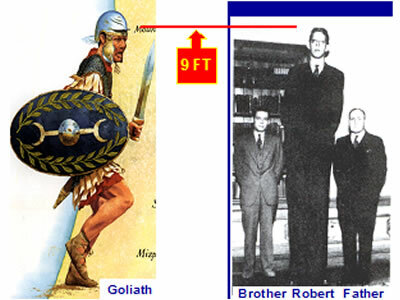 The Bible describes giants, before and after Noah's Flood. 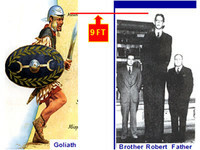 It is recorded in 1 Samuel 17:4 that Goliath was six cubits and a span tall, which is approximately nine feet tall (one cubit is approximately the distance from your elbow to finger tip). The Bible records, in Deuteronomy chapter 3:11, that the iron bed of Og, King of Basham, was 9 cubits by 4 cubits or approximately 14 feet long by 6 feet wide. Please see our Giants page for more about evidence of giants in the past. 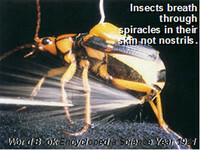 Insects breathe oxygen through spiracles in their skin. Their size is limited only by the amount of oxygen available. In the high oxygen Pre-Flood atmospheric conditions, insects grew much larger. 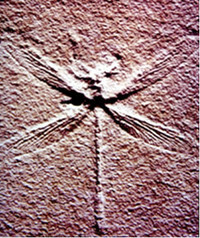 This Pre-Flood dragonfly was buried under tons of rock, instantly fossilised at Noah's Flood 4,400 years ago. 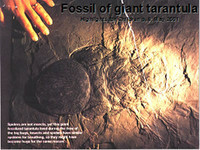 A fossil of a giant tarantula spider about 18 inches long has been discovered. 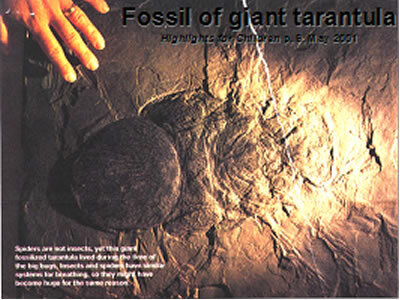 This Pre-Flood tarantula spider was buried under tons of rock, instantly fossilised at Noah's Flood 4,400 years ago. Cockroaches over 18 inches long have been found in the fossil record. 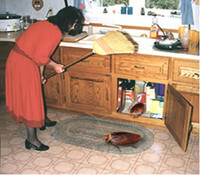 They would have been unpleasant pests in the kitchen! A fossil of a centipede eight and a half feet long has been discovered by palaeontologist in Germany. 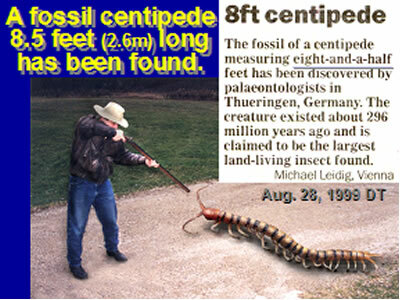 This Pre-Flood centipede was buried under tons of rock, instantly fossilised at Noah's Flood 4,400 years ago. 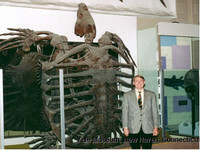 This giant turtle skeleton is exhibited at the Yale Museum, New Haven, Connecticut. It is approximately 10 feet high. This is simply evidence that giant turtles existed. 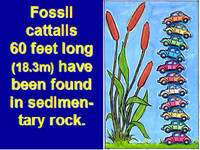 Fossilised cattails 60 feet high have been discovered in sedimentary rock. In the Pre-Flood atmosphere the Carbon Dioxide content was much higher because of the canopy of water. This high Carbon Dioxide content caused the cattails, and all vegetation, to grow much larger, and also more abundantly. Even today tomato plants grown in artificially created atmospheres in greenhouses with high Carbon Dioxide content produce very large crops of tomatoes. Vegetation before the Flood was superabundant, with extremely large trees, fruit, and vegetables. It was truly superabundant vegetation, all over the world. During the Flood, the huge forests were rapidly compressed under tons of rock, forming our huge coal seams all over the world. Coal can be artificially created today by compression of vegetable matter. We believe that animals and fishes were compressed at the time of the Flood to form the huge oil reservoirs. All of this God did by the great Flood, creating all of the oil, gas and coal and other minerals. 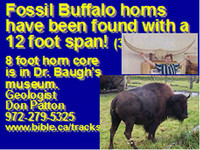 A fossilised buffalo horn with a 12 foot span has been discovered, and is in Dr Baugh's museum in the USA. This Pre-Flood buffalo was buried under tons of rock, instantly fossilised at Noah's Flood 4,400 years ago. 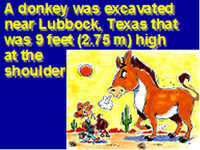 A donkey was excavated in Texas, USA, which is 9 feet high at the shoulder. This proves the existence of giant donkeys. 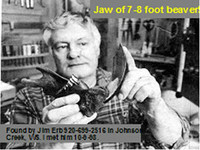 Fossils of beavers over 8 feet long have been found. These Pre-Flood beavers were buried under tons of rock, instantly fossilised at Noah's Flood 4,400 years ago. 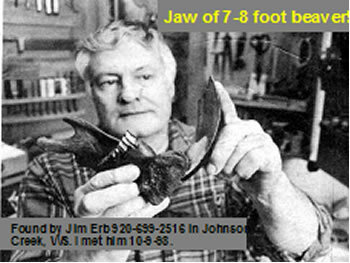 The jaw of a beaver 8 foot long has also been found in the USA, proving the existence of giant beavers.